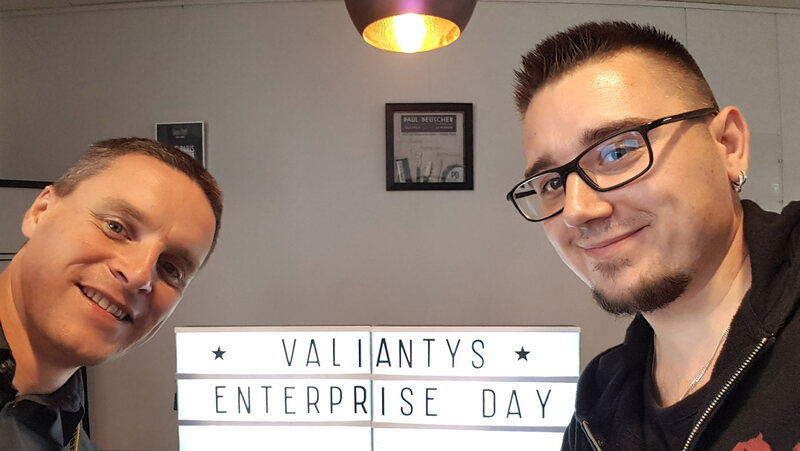 What to expect at Valiantys Enterprise Day? Ready to learn the truth about Valiantys Enterprise Days? We attended quite a few of them and plan for more. How good is Valiantys for projeverifct managers and Atlassian vendors? As they are quite selective, who do they actually invite? What costs and benefits to expect? Who you could meet during the London, Paris and Switzerland events? A photo taken during Valiantys Enterprise Day Paris on 13th June 2017. Pictured are SoftwarePlant delegates. You might wonder why not to head directly for an Atlassian Summit and skip partner events altogether. Warning! 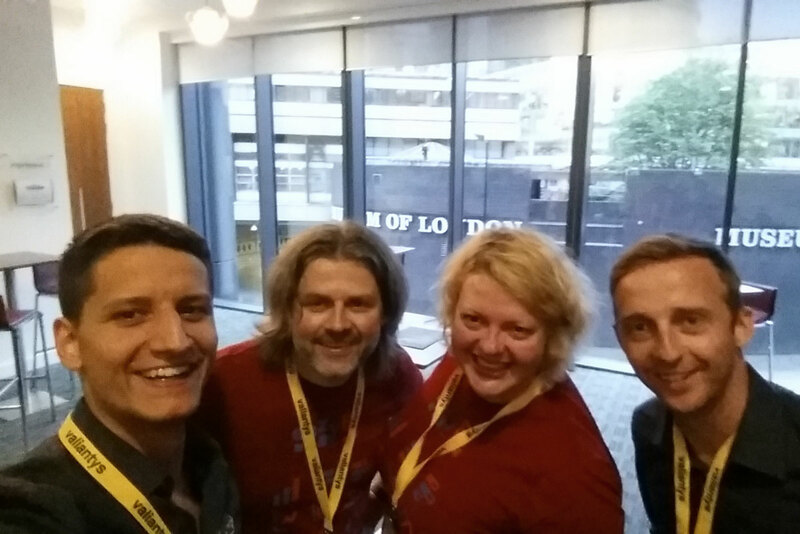 There are reasons to be at Valiantys event(s) – both for a project manager and for an Atlassian Vendor. We attended two Valiantys Days, i.e. London ‘2017 and Paris’2017, we plan to be at their 2018 London, Paris and Lausanne events, and would like to share our views. So, find all the why’s and how’s below. or find clients for your Jira apps, if you are a developer. Table 1: Compare Jira-related events, rough numbers. Valiantys Enterprise Day processes project managers What tool will provide top-to-bottom planning? We attended the ‘2017 and ‘2018 editions as a sponsor. This is what our Confluence recorded: Feels like a mini Atlassian Summit, only a little more up-close and personal. A chance to talk to experts and vendors and understand more about what they do. How about more details? Valiantys and SoftwarePlant team members. etc.venues St Paul’s, Museum of London is evident in the background. Roughly €1k to become the London Valiantys Enterprise Day sponsor. You might say that’s quite a bit, but compare it to what SAFe® charges for their summits. To be honest, we think the Days constitute less than a minor source of income for Valiantys. Lunch breaks are perhaps the most valuable part of Valiantys events. Here: London ‘2017 edition. Why you want to be there? Well, are you a project manager? You might have realized this bitter truth already: you sometimes need an external consultant. You are just not able to follow global trends as comprehensively and effectively as a global consultancy does. Even Boeing might have used MS Excel to manage projects at some point in the past. Even the large at some point decide that they need more than MS Excel, but they don’t know what’s good on the market. So what they do, given their budgets of $100k+? They approach Valiantys, Clearvision, cPrime and so on. Therefore if not for the sake of “lectures”, you’d better be there just to keep your name circulating in Valiantys records and for those unofficial talks – read samples of what we’ve learnt in London. Are you a Jira plugin developer? For a plugin developer, like us, the bitter truth is you can’t market your apps, or “spread the word”, without resellers, such as Valiantys. Valiantys will visit a client and tell them: you need Jira + Confluence + BigPicture + BigTemplate to meet your requirements. Why is Valiantys so precious for corporations? Because they advise on the whole package. Why is Valiantys precious for an app developer? Because they make impartial, or unbiased recommendations. These recommendations are more credible and preferred by their clients. Surely better than “pure advertising” of your own staff. So: See and be Seen. Even if you won’t get a booth and a “Sponsor” title, just travel to the next Valiantys Enterprise Day to give away your business cards. Relaxed atmosphere of a coffee break. Sponsors’ roll-ups visible in the background. 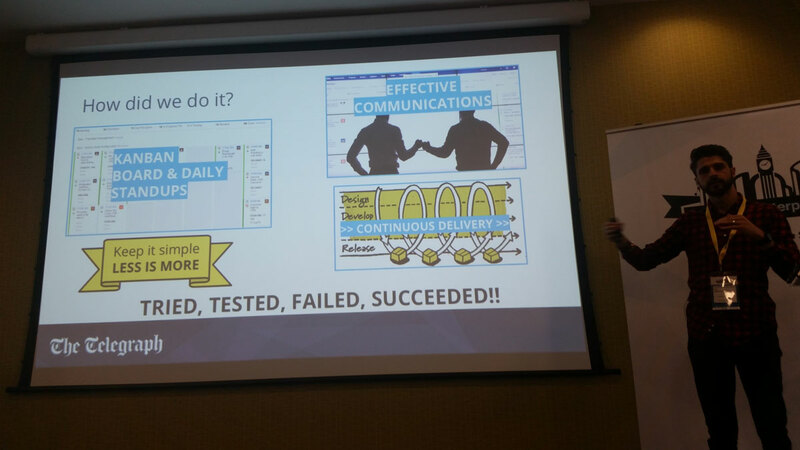 The Telegraph presentation on how they integrated Confluence, Jira, Slack and Trello. 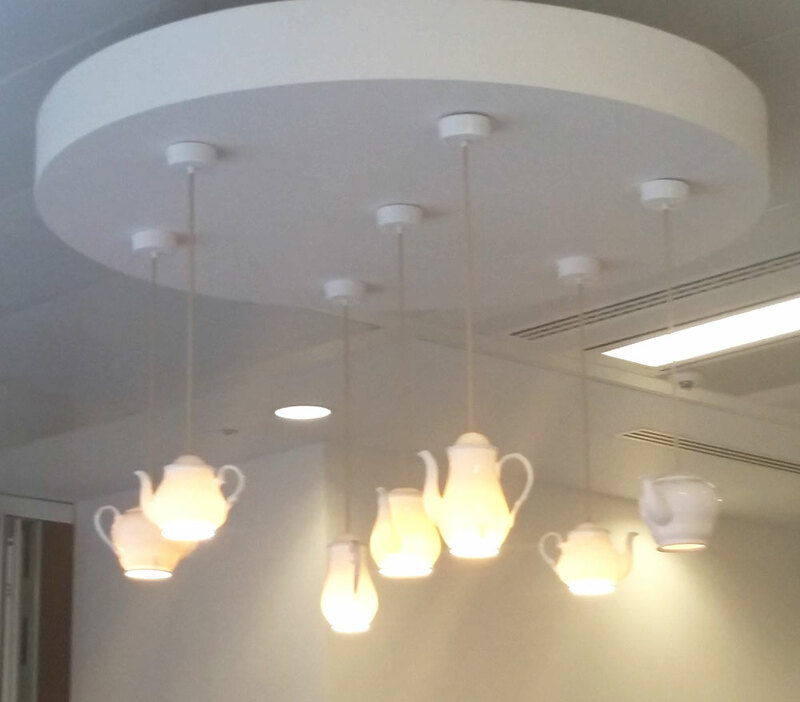 Brilliant teapot chandelier at etc.venues conference center, London. Remember “Mastering Jira” by Ravi Sagar? Ravi worked for Clearvision and we talked to him at the event. The Daily Telegraph employee enlightened us how they develop bridges in their own Confluence – Jira – Slack – Trello environment. A French project manager told us, how they use Jira cadences to plan weekly product releases. We realized how our own BigPicture would benefit from implementing releases/release notes to its logic. There are monthly Jira users meetings in London, we were not aware of that. Somebody suggested Jira notifications tend to get too noisy, and they demonstrated how to calm them down. RefinedWiki showed how their plugins work with Jira Service Desk. Somebody gave a lecture on how they had migrated from their own custom made software to Jira + Confluence. 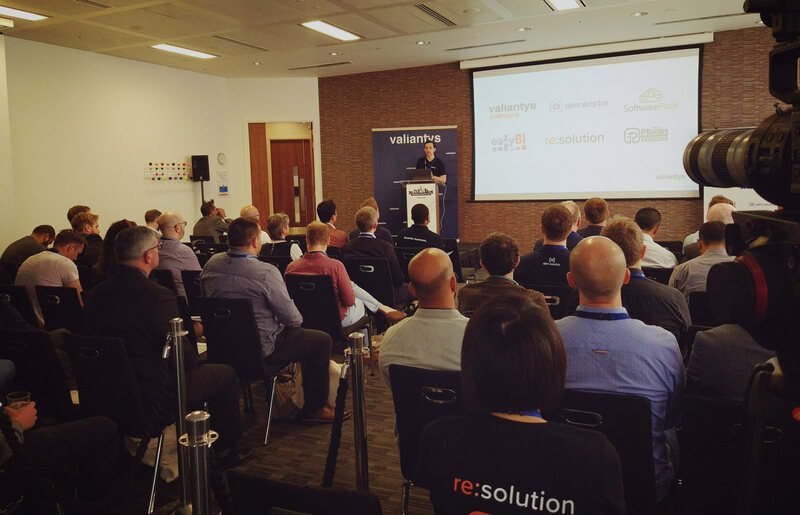 The sponsors of 2018 London VED are being presented to guests: Valiantys Software, ALM works, SoftwarePlant, eazyBI, resolution Reichert Network Solutions GmbH, The Plugin People. 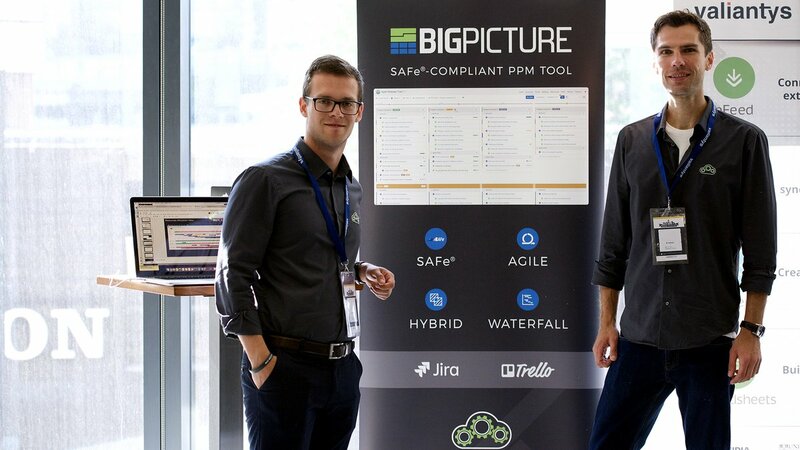 We promoted our flagship – BigPicture, now available for both Jira and Trello. 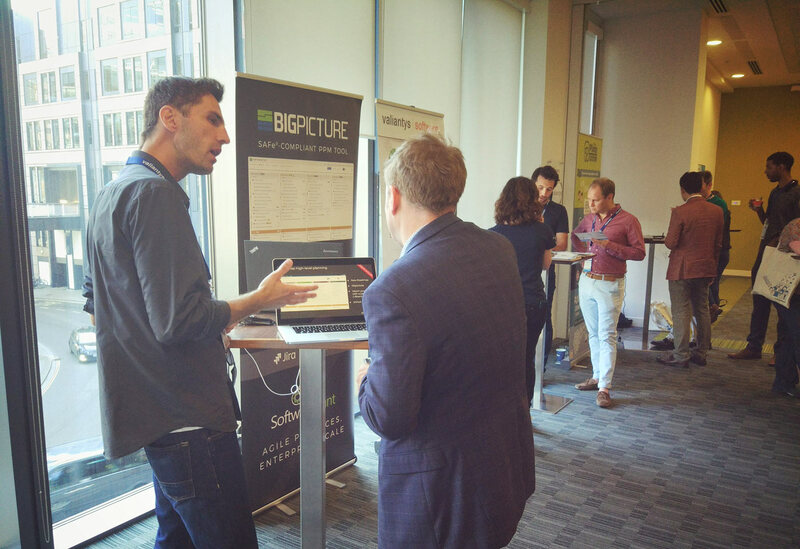 We’re discussing BigPicture PPM tool with a guest of 2018 London VED. 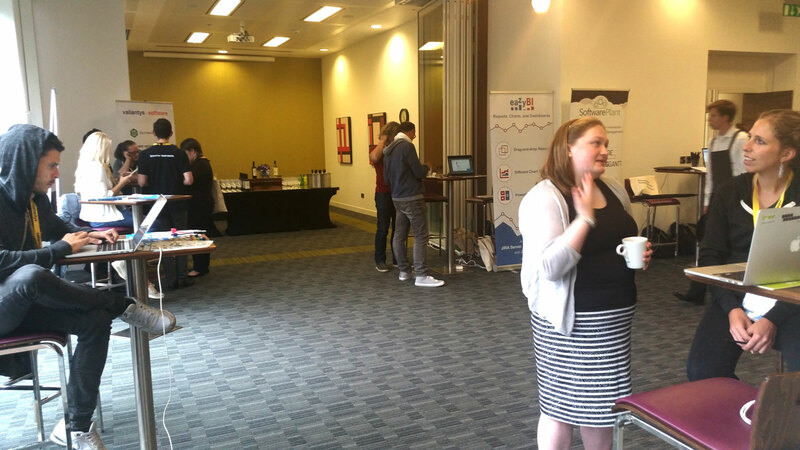 How profitable are potential clients at Valiantys Enterprise Days? Well, we always try to find clients for custom development services. You could find a long-term, loyal customer with $100k+ annual budget. Another thing to consider is that Valiantys invites people from medium and large companies, less so from startups. These companies tend to buy licences from the more lucrative 100+ tiers. You could ponder: a 100-licence customer won during Valiantys event basically equals a 100-licence client from Atlassian Marketplace… With the latter being far cheaper to acquire and the same revenue from each, what’s the difference? Sadly, we found this kind of thinking incorrect. Reviews on Atlassian Marketplace pose an issue. We’ve discovered that the majority of 1-star reviews on Atlassian Marketplace result from lack of communication between a client and an app vendor and not from the app being faulty. People are just quick to post a review, whereas the obstacles they’ve encountered tend not to be real problems. These users are often a single e-mail away from a solution. Now, Valiantys solves the communication issue, as they talk to a client directly. With “agents”, such as Valiantys, instead of getting a negative review, you reinforce your apps’ credibility as genuine and plausible solutions. Isn’t Valiantys an Atlassian app vendor? If so, why do they invite competitors, such as Softwareplant? Valiantys indeed sells their own apps on Marketplace. But again, they are, most of all, a global consulting company. They need a choice of plugins for their clients. They need not one but several Gantt chart modules in their portfolio to be more competitive. Can I just skip Valiantys Enterprise Day? As a project manager you might, but we really find Valiantys events top-notch, even compared to other Jira partners’ events. If you develop PPM apps for Jira, however, then it would be silly not to give Valiantys a try. Without these events you could easily fall off the radar of one of the most active Atlassian solution partners.